Every week is shark week at the Georgia Aquarium! Discovery Channel's annual Shark Week has stimulated public interest in sharks to the point of the shark-mania brought on by the 1975 blockbuster "Jaws." Georgia Aquarium, the world's largest aquarium (which still fascinates me given Atlanta is landlocked), offers to satiate any shark-lovers desire to (safely) observe a shark...quite a few sharks, actually. Even remotely located shark enthusiasts can enjoy the sharks living at Georgia Aquarium through the Ocean Voyager Webcam. 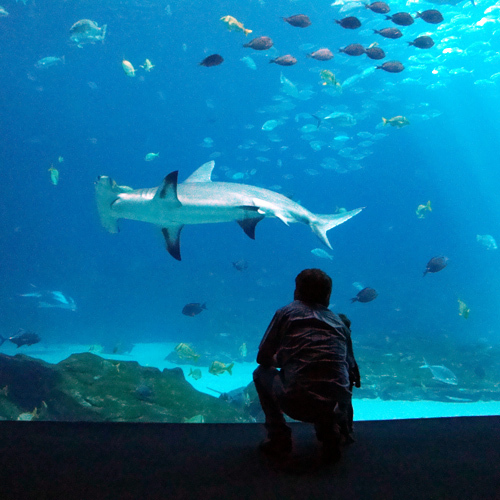 Ocean Voyager is one of the major galleries at Georgia Aquarium, built specifically to house the Whale Shark—the largest fish species in the world. Cohabiting with the Whale Sharks are "schools of jacks, squadrons of small and large stingrays, enormous goliath grouper, and sharks" in an ocean habitat containing more than six million gallons of saltwater. But since we're talking about sharks, you may find it of interest that there are numerous kinds of sharks living in Ocean Voyager. They include: the whale shark, blacktip reef shark, spotted or tassled wobbegong shark, zebra shark, sandbar shark, sand tiger shark, and the recently added and a crowd-favorite—the hammerhead shark (photo).